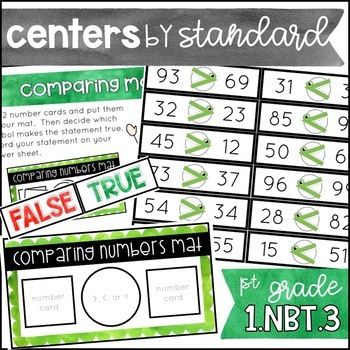 'Centers by Standard' was designed to give your students extra targeted practice with comparing 2-digit numbers. Model how to complete each center with your students, and then allow them to complete independently, in small groups, or in a guided setting with you! Three centers that will give your students extra practice with CCSS 1.NBT.2. 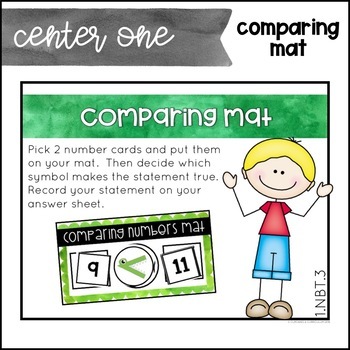 Students will pick 2 number cards and put them on their mat. Then they will decide which symbol makes the statement true and record the statement on their answer sheet. Alligator symbols and regular symbols both included – choose what you’d like to use! Number cards include numbers 1-120. Use some or all of the numbers for differentiation! 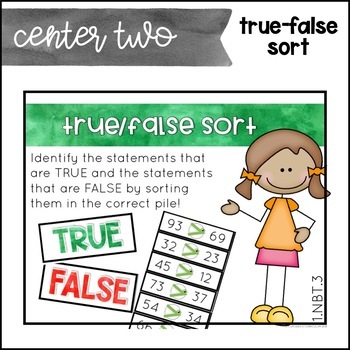 Students will identify 24 different statements as TRUE or FALSE by sorting them into 2 piles. Answer keys are provided for students to check their work. Students are given 24 task cards and an answer sheet. Students will need to write a number that would make a statement true, write the correct symbol for a comparison statement, name a number greater than a given number and name a number less than a given number. Answer key provided. WHAT ELSE WOULD MAKE YOUR ♯TEACHERLIFE EASIER? ➡ Are you looking for easy math assessments to drive your instruction? ➡ Are you looking for more fun math activities for your emergency sub folder? Check out Place Value Games. ➡ Are you looking for some place value task cards? Check out Place Value Task Cards. ➡ Are you looking for prep-once fact fluency centers? Check out Fact Fluency Warm-Up Bins Addition and Subtraction. ➡ Are you looking for engaging measurement centers to use all year? Check out Year-Round Measurement Centers. Looking for some humor & positivity in your #teacherlife? Hey there! I'm Jennifer, an experienced first, third, and fourth grade general education classroom teacher, I also have experience as a special education teacher's assistant and interventionist. I earned my Bachelors' degree in Family & Child Studies, and my Masters' degree in Elementary Education. I've been creating resources on Teachers Pay Teachers since 2012 to help teachers like you find your work-life balance - you are so much more than just an awesome teacher!